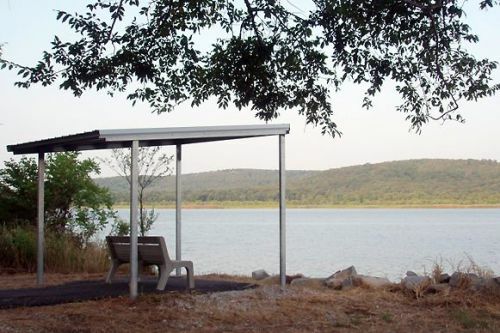 Sandtown Nature Trail offers an opportunity for visitors to explore a nature trail while observing the resident and migratory wildlife and breathtaking Oklahoma landscape found at Sequoyah National Wildlife Refuge. This one-mile long loop trail meanders along the river and showcases animals like American bald eagle, bobcats, deer, and more! Benches, observation decks and an informational kiosk. Location: Sequoyah National Wildlife Refuge near Vian, OK in Sequoyah County. From Vian, travel south on the county road, N4520, approximately three miles to Refuge entrance. Once on the Refuge, follow signs to Sandtown Bottoms. The Sandtown Nature Trail is part of the over 20,000 acres of lands that encompass Sequoyah National Wildlife Refuge. The Refuge provides homes and shelter for animals and plants. Late prehistoric Native Americans, the Caddoans, called this land home. In addition, this area was connected to the “Trail of Tears” waterway, which thousands of displaced Cherokee Native Americans were forced to travel through during the late 1800's. Today, this trail offers a place for people to commune with nature while exploring and observing the wildlife on the convenient loop around path. Observation decks and benches are available for visitors' convenience. The trailhead kiosk provides additional detailed information about the refuge, its inhabitants, and maps of the area. The one-mile paved trail offers a view of the Arkansas and Canadian Rivers' delta, where people can watch bald eagles scanning the water and hawks scouring the land for prey. School groups find and explore an amazing array of tree and plant species, which attract various kinds of brightly colored butterflies, dragonflies, songbirds and more. The refuge is a sanctuary for bobcats, although it is rare to get a glimpse of them. Luckily, many animals are not as difficult to see. During the colder months, beautiful snow geese can easily be seen from the trail as they fly about the refuge. Other animals, like deer, armadillos, raccoons, and waterfowl can easily be seen along the trail. Whether guests are taking in the sights and scenes of the landscape, taking photographs of the wildlife or foliage, or exercising after a hard day at work, Sandtown Nature Trail is a wonderful place that offers a glimpse at the variety of flora and fauna that flourish in east-central Oklahoma. This trail offers a great way to spend time with friends and family.